So. Jupiter is in Taurus. What about it? Jupiter wants to offer each of us luck and expansion in areas where we most need it. Molly Hall, an astrological teacher of mine and all around amazing person, writes in her extremely informative book, KNACK ASTROLOGY, that “Jupiter stands at the leading edge of awareness as a herald of future visions and potentials, leading us beyond known limits and constantly expanding our perspective.” In essence, what she is saying is that Jupiter allows us to see past the narrow perceptions we have created for ourselves. It’s present when we ace that intimidating interview and land our dream job. It’s in the room when we finally have the courage to go up to someone who has caught our eye and say hello. It’s the nudge we get to say yes to that trip that seems impossible to pay for but ultimately inspires us toward a major life transformation. Jupiter wants to offer each of us luck and expansion in areas where we most need it. And, it can be most beneficial when it’s pushing us to see a personal truth about ourselves that we are deeply afraid to face. Everyone should become aware of where Jupiter is in their lives. That knowledge will help give birth to the abundance we each need to thrive. 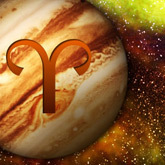 This past weekend, Jupiter finally ended its almost four and a half month stint in Aries to move on to Taurus, where it will stay for about a year. Now if Jupiter in Aries was all about getting the spark of inspiration to expand in some area of your life, its move into Taurus should be more about manifestation. The beginning of this year was offering you an opportunity to look deeper at an inner part of yourself or at a specific area of your life so that you could push through the barricades of your own internal conception. This next year will be beneficial for bringing new modes of being into fruition. Taurus is a physical sign. It wants a solid foundation to build stable structures upon and can be a guide for each of us on how to do so in our own lives. Jupiter’s stop off in Taurus will illuminate a different life sector for each sign. Let’s take a look at how Jupiter’s long stay in Taurus could be affecting you, and most importantly, how you can make the most advantage of its potentially good fortune. Remember, if you know your rising sign, read that too. If you don’t know it, send me a message with your birth info through my PERSONAL READINGS section, and I will find it out for you. It’s important to know! In fact, I will be addressing the rising sign in a future post. Jupiter’s real goal is for you to do some personal growth. As mentioned, your time in the Jupiter light is over, but this doesn’t mean that your good fortune has come to an end. In fact, it’s not like the past four months have been all roses and sunshine. There have been moments of pure luck but also some difficult challenges to face. That’s because Jupiter’s real goal is for you to do some personal growth. He will give you a large gift, but then you must rise to the challenge of being ready to accept it. So, I would venture to say that these last few months have offered some doorways of opportunity that possibly left you feeling a little ill-equipped to handle them. And that’s okay, because it ultimately has just pushed you to expand on your idea of self. You’ve had no choice but to reexamine who you are, and this time has given you more than a handful of ideas about what will make for the best version of you. Now you must commit to one. Of all the possibilities that have risen up when visioning the life you want, what has carried the most weight? Put your clearest focus into it, and let’s see how in a year’s time, you spin the yarn of your dreams into pure gold. It’s time to put all of that self-analysis to the test. The time has come! You have been cleaning out those mental closets and getting in touch with every nook and cranny of yourself. Well guess what? That was only the beginning. Now it’s time to put all of that self-analysis to the test. You have a strong idea of who you want to be and the steps you need to take to achieve that goal. And you’re pretty much right. Well, seventy percent right. And honestly, you’re only fifty percent prepared. See, unfortunately you can’t get around the one thing in your plan that you have been trying to avoid. It’s the dragon in your quest. The part where you test your courage and strength. This means you are going to have to initiate that one conversation that makes you bite your nails in your sleep. Or you have to say yes to that one idea you know is going to take boundless amounts of time and effort to accomplish. Now it’s a yearlong process so start this week by simply tempering some of that built-in stubbornness of yours. And know that if you’re unclear about what it is you need to give over to, ask. Someone you love will know and tell you. Or your mirror will. Jupiter’s orbit through Taurus is going to keep your heart a bit more on your sleeve than usual. I know you’re feeling that this recent shift into Taurus has taken you for a bit of an emotional spin. And we all know it isn’t the most comfortable space for you to be in. Know that you will come into a real time of grounding soon when some of the other planets shift into Gemini, but this yearlong Jupiter orbit through Taurus is going to keep your heart a bit more on your sleeve than usual. And it’s time for you to integrate more of that sensitive, affectionate side of you that’s reserved for only your closest friends into the rest of your life. You Gemini’s have a rep for being all wit and no heart. But those who have taken the time to know both sides of you have seen the deeper part that exists in the crack where your twin selves meet. And that part of you is where you probably access all of your soulful artistry. This year is the time to allow that expressive side of you to emerge and take the reigns in all that you do. It will create greater success in love, money, career, and your family life. Yes, being vulnerable will be entirely hard, but you have the strength to take on the challenge. So seize it. It’s very easy for you Cancer’s to get consumed by your inner world. You have an inherent need for structure in your home and family life, and recently that feeling has intensified. Maybe you’re married and have been working harder to create a more solid foundation for the family you have or potentially could have in the future. It could be that you’re single and are more driven to finally set up a space that feels a hundred percent your own. Either way, you should feel determined to continue on that focus. However, it’s very easy for you Cancer’s to get consumed by your inner world so that it all becomes about work, home, and the few close people you have allowed into your lives. It’s certainly a beautiful shell to have but also know that there’s an entire world out there that you haven’t really touched yet, and you have talents and wisdom to offer beyond what you’ve already grown used to sharing. So try this: make one weekend each month a home-free weekend. Yes, you can come home to shower, sleep, and have a meal or two. But other than that, explore your surroundings more, meet some new people, and mostly, take a break from your comfort zone. Why settle for a life of getting by when you are meant for complete greatness? Consider yourself a blank canvas. These next few months are going to see you back in touch with your career self. Perhaps you have been too busy idealizing your perfect job or the work you’ve been doing recently isn’t properly utilizing your talents. Or maybe you just haven’t been working at all. Whatever the case, it’s time to get back on the clock and focused. However, don’t feel like you need to make up your mind yet about what you should be doing. Even if you have worked in the same field for twenty years, it might be time to own up to that small feeling of complacency. This next year is going to give you an opportunity to explore some new possibilities for your life. You may have fields or professions you have considered before but never felt were logical for the life you lead. Well now is the time to move past those limitations. Take some classes. Visit new cities. It may be that the next stage of your life isn’t meant to happen where you live now. Consider yourself a blank canvas. Yes, you need to earn a paycheck so dive into the work you have. But make creating your future a fun, second job for you. I expect this to be one of your greatest times in years. Is it starting to get redundant? That consistent feeling of having change and transformation as a theme for your life this year? Well, buckle in, because there’s more to come. Jupiter has an exciting year of deep, internal metamorphosis planned for you. There is so much newness in your set list right now, that I expect this to be one of your greatest times in years. However, it’s going to be a challenge for some of those that currently share your life. See, the Libra is all about the people around him or her, but there comes a time when everyone has to authorize a “me first” mentality, and this is your time to do it. So some of those fires you’re lighting on old ways of being may claim some victims in your personal life. But, you Libra’s will make sure that it’s handled with everyone’s best interests on the table. And you will be aware of those who truly belong in your sphere, because their own personal transformations will pair beautifully with your own. And a Libra loves a matching set. So, yes some in your life may not get the new you. But for once, don’t let it be your problem. You may have to let your guard down and get a little more vulnerable. Scorpio, you have worked hard these last few months on expanding your sense of foundation in life, and it has granted you greater independence. But it’s also allowed you to seclude yourself a bit. Well, now it’s time for your coming out party. Believe it or not, while you’ve been out establishing yourself in the world, your heart has been cocoon-ing and it’s desperate to show itself. These next twelve months are going to offer you an opportunity to welcome some new close relationships into your life that will push you to see yourself in a different light. You may have to let your guard down and get a little more vulnerable, but trust that you have the ability to do so. And this isn’t just about romance (though for some, it is.) You may already have the spouse and kids of your dreams. Jupiter is going to open relationship doors in every part of your existence. Exciting new work or a creative project may enter through a new friend. It’s all about making sure that your emotional self shows up with the rest of you everywhere you go. This will help you attract the people you need to rise to the next level in life. You only live once in this body, so try creating the most conscious relationship with it that you can. In these next twelve months, Jupiter wants to open some doors for you and your health. You may have an established routine that works well for you, or you may not have one at all due to time restraints or just a general lack of motivation. But who doesn’t want to be healthy? Perhaps you just need to ask yourself exactly what that means to you. Not everyone is going to have a teeny tiny waist and work out eight times a week. So don’t feel the need to look into diets or organized fitness routines. Find out what works for you and commit to it. This is your year to really get into the kind of shape you have always dreamed of, so why not take it on. You only live once in this body, so try creating the most conscious relationship with it that you can. Make figuring out what type of food and exercise works best for you a complex puzzle to solve. Try investigating alternative methods of health and fitness. Read books on where food comes from. It doesn’t all have to be elipticals and weights. Make it fun, exploratory, and informative, and you’ll be on the road to a healthier you in no time. That creative spark of yours is itching to be turned into a full flame. I’ll say it again. It’s time to get more creative with your life. Simple words, yes. But for real, you need to have more fun. It’s easy for your lot to be so serious all the time, but it’s time to let loose a bit. Even if you’re fighting that truth, Jupiter is going to force it upon you this year. A new sense of inspiration is going to find itself into your life. That creative passion you have been tiptoeing around or paying little attention to is now going to become the loudest voice in the room. No, this isn’t going to cause you any hiccups at work, and your bills will still get paid on time. However, you will find yourself attracting and being attracted to those who live on the lighter side of life. And please, let them in. These free spirits have something incredibly meaningful to teach you. At first, you may feel that urge to put up a wall but fight it. That creative spark of yours is itching to be turned into a full flame, so every person, dog, cat, chicken, camel, or tissue that crosses your eyesight, invite in as a potential inspirer of chaos, wisdom, and inventiveness. You will be amazed by what it offers every area of your life. You are feeling an urge to form your own, more permanent home. You are usually known to be a conspirator of enthusiasm and ingenuity for others, and still have that impressive ability, but lately that well of encouragement has been a tad dry. It may be because you’re in a process of cementing your own sense of foundation. This Jupiter cycle is all about enlarging your personal infrastructure. The best way to get that process started is to examine your relationship with your family dynamic. Don’t dwell on the bad but recognize what you still may be carrying around with you that no longer serves a function. And if needed, then use your creativity or your skill at communicating, with them directly or with a stranger, to let it go. Then, focus on the positive. What great things has your family taught you? Are they the greatest champions for your ambitions and talents? All of this is important internal work to do because you are feeling an urge to form your own, more permanent home. Yes, a move, marriage, or children could be in the works. But in order to successfully establish a new home, you need to know what energies to, or not to, invite into it. Embrace that part of you that has something to say about everything. You’re so fluid in your approach to life that it’s easy for your own thoughts to get muddled in with everyone else’s. You may have an opinion about something at work, that dress your friend is wearing, or what should be had for dinner, but unless you’re extremely comfortable with everyone in the room, you may just acquiesce to the majority. But you know that when it comes to your beliefs, you can be extremely passionate. It’s just that passive nature can get the best of you. Well, these next twelve months are going to allow you a crash course in speaking your mind. Now again, when in a room with some trusted peeps and a bottle of wine, you can be the loudest one there. But Jupiter wants for you to be confident in every setting, without the help of friendly, or alcoholic, back-up. So embrace that part of you that has something to say about everything. In fact, a good primer for you would be to start a blog. It would give you a place to say exactly what’s on your mind without the fear of retaliation or judgment. And you can wear your underwear while you work. We know you love that freedom. What do we have to lose by investing in being truly present in our lives? As an Aries, I was initially peeved that my sign only got Jupiter’s love for four months while the Taureans get it for an entire year. But then, I allowed myself to take comfort in knowing that every transit has an effect on us all, regardless of whether its directly in one’s sign or not. And right now, we all apparently need twelve months of grounding, sensitive Taurus energy. I know that for me, the last few months have been a time of immense growth and have allowed me to see myself and the world with new eyes. So I smile with gratitude as Aries passes the baton, and I’m looking forward to whatever gifts, trials, and awakenings the epic Taurus transit has in store for me. I hope you will adopt the same sense of openness about this planetary shift and that you give yourself the chance to truly be aware of it. I mean, why not? What do we have to lose by investing in being truly present in our lives? Our life is ours to gain. So. It’s a new moon in Gemini. And a solar eclipse to boot. What about it? So. A full moon in Sagittarius. What about it? You’re amazing, Angel. And always so spot on.